Corrie Class Trip is a project where we rotate the selection of a title for group watches on an appointed day/date to then discuss [previous iterations linked below]. We welcome all to participate and share their thoughts and feelings! The inaugural viewing for Round 3 is scheduled for Saturday August 12th. Please post about the film itself and your experience with it in this thread, and any off-topic posts about the series itself in the Class Trip Discussion Thread. Educated young Rose (Madeleine Renaud) finds herself in a tough position when her father files for bankruptcy. She takes a job as a maid at a center for children, most of whom come from tragic circumstances. 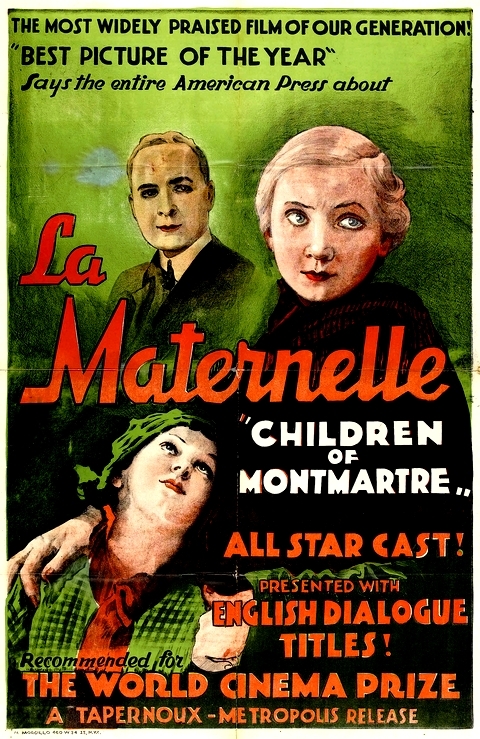 Sensitive and kind, Rose is quickly a favorite, especially with young Marie (Paulette Elambert), whose prostitute mother has all but abandoned her. Discovering Rose is overqualified, the school head insists she give up her job, to the dismay of Dr. Libois (Henri Debain) and the children. Yee, looking forward to getting these back on the road. Anyone else see it yet? What did you think? yeah I agree about the little girl's story and maybe it would have been a stronger movie had it centered on her from the get-go. I'm not opposed to any inspirational teacher stories but the maid character was too saintly to be all that interesting (even if she wasn't Bing Crosby in The Bells of St. Mary's level saintly). like, that was one huge cut from the opening sequence to the scene where she has already lost her fiance. I was sorta hoping her character would have been illuminated in her interactions with the kids a bit more. especially when you're dealing with someone who lets a man embrace her to prevent further child abuse. it's too short to overstay any welcome so I remained charmed. but I still wondered if it couldn't have benefited from either a longer running time or a more centered story e.g. have it just be about that little girl. I agree, the little girl would've made a better lead character. I mean, look at her eyes! I liked it. The more standard issue material between the adults felt a bit dull, to be honest, but whenever the movie focuses on the kids it just finds a lovely way to portray these characters and their (limited) world. These children are shown as genuine (and fragile) human beings, not just a cheap trick to make your audience care. There are several great scenes, but one that stood out to me specifically, is the moment Rose learns one of the children how to smile. Something about that just felt so, i don't know, gentle. yeah I loved the smiling scene too! but! I'm always glad to see stuff outside of the usual canon. Sorry I haven't made this yet. I'll watch it today and report back! Nevermind, I suffered through the rip - but loved this, honestly. It's got that trademark impressionistic, loose style of the embryonic poetic realist movement, with a lot in common to Epstein's brother, Grémillon, Vigo, Kirsanoff and early Renoir, including some flashes of invigorating montage that give it structural sophistication and dynamism and keep it from feeling too homespun or saccharine. I appreciated the child-friendly storytelling - it's a film that could be enjoyed by the same kids it's about - and the naturalistic, location-based shooting style that owes as much to the filmmakers I mentioned earlier as to the basic logistic and creative challenges of working with so many very young children. There's a proto-feminist thread here that I wish had been given more weight - there were some blatant visual associations comparing the fiancé who abandoned Rose at the film's outset and Dr Libois after his marriage proposal, though of course in the end the latter is redeemed and, presumably, Rose leaves the kindergarten for life as a homemaker (hopefully with Marie if so?). I wish the film were clearer on this front as to leave that story thread without real closure seems almost like a betrayal of its ideals - I can sense Marie Epstein gunning for a more unequivocally feminist conclusion, but I wonder what the reasons for leaving the story as it was were. That being said, there's a lot to love here, it's moving and easy to watch, and there's even a rudimentary class analysis here, using Rose as a symbolic bridge between classes (witness how she pulls others, like Libois and Paulin, into her sphere of class-blindness) and a figure of reform, especially in its refreshingly issue-focused lens on early childcare and education, in which the film advocates for a move towards less rigid, more individual-focused learning. Madeleine Renaud is the perfect actor for this part, simply but powerfully expressive with a beautiful, wide-open face and a clear way with the child actors, who are very good - especially Paulette Elambert who played Marie. I also enjoyed Mady Berry's contribution as the jovial fellow maid. Liked it a lot. I didn't mind Rose's saintliness so much - she's definitely a tropey figure, especially for this era, but Renaud gives her an unforced humanity and I think her weakness for kindness and loving attention is rendered subtly - from the ellipsis between her fiancé's proposal and her job interview, to the way she clings to Marie as if for support and the way she forgets about Marie other than to defer authority to Mme Paulin as she leaves the school to hang with Libois after he courts her. I think it gives a sense of the flaws and insecurities that shape, for better and for worse respectively, her relationships with the children and with the romantic interests - you leave feeling that there's something more valid to Marie's concerns than pure childish jealousy or fear of abandonment. But at the same time it does give Rose a sense of innate decency that gives you hope that she can work through this for the sake of the kid/s in her care. yeah I feel too bad it never grabbed a hold of me but you're right about it not being too saccharine, which I definitely appreciated. especially with an ending that was more "a hope for something better" than "everything is okay!". also I remember feeling the whiplash when it went from the fiance scene to the interview scene; I don't know if I had assumed some missing information from that time would be revealed down the line but you're probably right that it was meant to sandwich two big scenes of her reaching out for some kind of human connection. I just rewatched the beginning and noticed that one scene ends with her fiance's hand on hers while the second begins with one of her own hands stroking the other. which ought to have said it all without some big speech about her "motivation for seeking this job because etc etc etc". and since you brought it up, what would suggest as a good start for anyone who hasn't seen any of Jean Epstein or Jean Gremillon's work? I took the second image as one of her sliding her ring off. The scene with her fiance's hands on hers is mirrored later with a shot of Libois' hands on hers, which is why I was surprised that the film betrayed the connotations of that shot by ending their story on a 'hopeful' note (if you take her leaving the job she loves to be a housewife to be a hopeful thing). Epstein's Coeur fidèle is a classic, I'm mixed on Grémillon but I really like La petite Lise. snapper wrote: I took the second image as one of her sliding her ring off. a-whoops. to be fair, the picture quality wasn't super. Ox, do you want to do the next round? Just pick a film that you doubt most of us have seen (pref. from a director whose work you doubt we're familiar with), etc etc. I mean I can, but it's gonna be really, really, really, really mainstream compared to the stuff from the last class trips. and I'll probably need someone else to find a copy online. or I can always find something that I also haven't seen but again I'll need you guys to find it online for me. like, I recently saw Lubitsch's Cluny Brown on TV but I'm sure you are all very familiar with him. I don't have any KG bonus at the moment - if it's something Asian I can check Avistaz because my ratio is fine there (thank god you can pay for ratio lol). Chuck some ideas out and we can see what we can get together. With luck it'll be something I have on my hard drive already. 'Mainstream' isn't an issue, corrierinos are probably less likely to have seen mainstream stuff haha (except for Lubitsch, yeah we're all familiar haha). The goal is for everyone, including you, to see it for the first time together essentially so think of something you haven't seen that you'd like to. OK, I've had this for nine months now, and am just watching it. Huge apologies!!! I really enjoyed this. The kids were so natural, the school the perfect amount of chaotic, and the older maid/matchmaker was completely believable, too. I think the girl (Marie) is just as much the focus as Rose. In fact, our first glimpse of the school involves Marie arriving early (because her mother "kicked her out") and she's our window to the kids' world. By the end, their stories are so intertwined I think it's clear that Rose will have to take responsibility for Marie in the end. I didn't think she was shapeless. Or, even too saintly. We only see her with the children and they're clearly an outlet for her. They're her therapy. I loved watching her face. I guess that makes me one of the schoolkids. Look, I even wrote her name on my arm, haha.